Made from the finest quality soft leather, the Ash Women's Virgin Wax Hi-Top Trainers in graphite grey combine style with the ultimate comfort. Fastening securely with four silver-tone buckles and a side zip, there's also an additional, decorative buckle to the side of the upper. Boasting a durable, white rubber sole and rubber toe cap, these trainers are the perfect casual shoe. Women’s ‘Gel-Lyte Komachi’ trainers from Asics. Crafted from breathable mesh, the athletic one-piece upper comprises a rounded toe, lace up front with tonal laces and signature side stripes. The trainers sit upon a lightweight, tonal midsole with Alpha Gel to the heel for comfortable wear, and are complete with Asics branding appliquéd to the tongue and ‘Gel’ printed to the reverse. Upper: Mesh. Sole: Rubber. Women’s low-top mesh trainers from Asics Lifestyle. Constructed with a one-piece upper with an integrated tongue and contrast faux suede panelling, the ‘Gel-Lyte V Sanze’ sneakers boast a reinterpreted, updated design of the brand’s iconic Gel-Lyte V model. Featuring a round toe with a rubber toe guard, an asymmetric lace-up fastening and padded collars for optimal comfort and support. The midsole showcases a newly developed visible GEL inserts in the heel for enhanced shock absorption, while the treaded rubber outsole offers maximum grip and traction. Branding to the tongue and an embossed heel logo completes the innovative design. Upper: Synthetic. Sole: Rubber. Women’s ‘Gel-Lyte V Sanze’ suede and mesh trainers from Asics. A reinterpretation of the iconic 'Gel-Lyte V' sneaker, the ‘Sanze’ has a modern design that draws elements from Asics iconic range of heritage footwear. Crafted with a one-piece mesh upper, the sneakers are designed with a monosock liner for comfort, suede overlay panels and overlapping sections on the tongue with linked eyelet stays to ease stress on the instep. The low top trainers sit on a newly developed sole with large visible Gel inserts in the heel and a transparent TPU cup for cushioned comfort. Complete with signature branding throughout and pull loops to the heel and tongue. Upper: Suede/Textile. Sole: Rubber. Women's ‘Gel-Movimentum’ black grained leather trainers from Asics. Originally developed for Dutch track and field athletes in 1986, the low top sneakers are designed with a lace fastening, iconic tiger side stripes and an oversized heel counter just like the original design. The low top trainers sit on a Gel cushioned white midsole with grooves that provide support and flexibility, whilst the textured rubber outsole provides enhanced traction. Complete with a brand patch on the tongue and Gel branding on the heel. Upper: Coated Leather. Sole: Rubber. The Aurora Mood Clock works its way through no fewer than TWELVE colours as it phases through the spectrum. If you're prone to seeing only shades of grey first thing in the morning, imagine the joy of waking up to this gorgeously moody little clock, which cycles through the different colours, quietly changing on each hour to remind you that time waits for no-one. 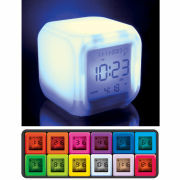 If you use it as a bedside alarm clock, you can switch off the rainbow effects while you sleep. All it takes is a gentle tap on the clock's tactile, rubbery top to light it up for about 30 seconds so that you can see the time without knocking your glass of water or book off the bedside table. Featuring a cute bear face design, baby bear ears and silver handle, this lovely Baby Bear mug is the perfect gift for a special little one. With 'BABY bear' written on its side, remind them that they're the most loved baby bear in the world with this gorgeous mug.